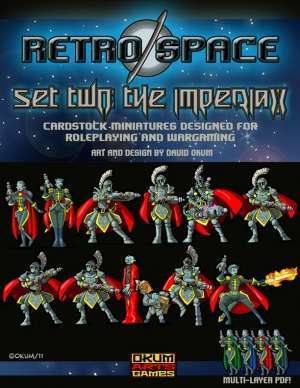 Announcing Retro Space, the second line of cardstock miniatures from Okumarts Games. 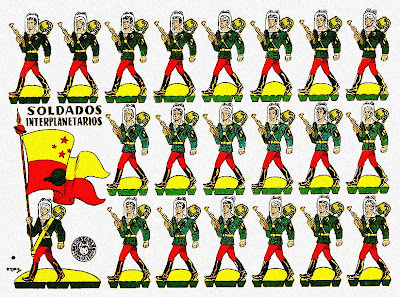 With multi-layered PDFs entire armies can be created with a single set. That's a very cool set. 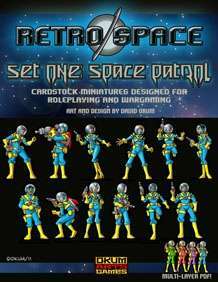 Retro Space Set One: Space Patrol is now available! 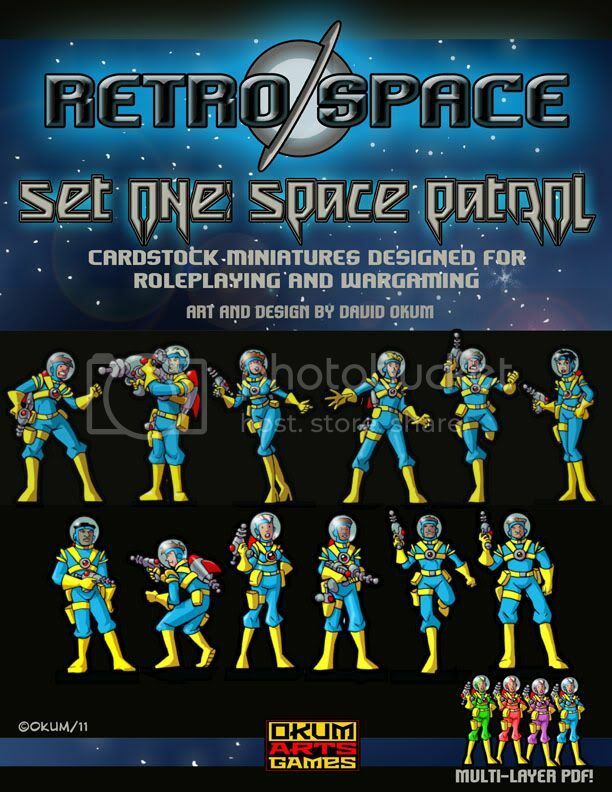 This is a multi-layered set allowing you to customize your Space Patrol Units! Next set will be out this Wednesday or Thursday. Will the next sets be bad guys and monsters? When I was sculpting originals for the metal manufacturers, I always wanted to do some figures like these, but I never could because there was no way to do the fish-bowl helmets. So I'm glad you've made these available. I've been a fan of the original Buck Rogers newspaper strips for decades, and I 'd love to run some retro-sci-fi adventures. I reckon the Space Patrol has contingents from the human colonists of different planets: blue are from Earth, red are from Mars, green are from Venus and purple are from Jupiter. This could become important if there are civil wars in the solar system. - civilian spacers, dignitaries, celebrities, etc. I would love to see some tiles and props in the 1950s style of Wally Wood. Cool suff, David, very cool stuff indeed! Oh... and some art deco ships! I think my templates for adventures would come from Doc Smith's Lensman series, as well as the comics. Another very nice set sir! Set Two: Imperiax is coming out this week! Why are the evil ones so hot. I'll wait for the second set and get them both. So are the vehicles you are thinking about similar to the black & white Buck Rogers/Flash Gordon ones? There are three vehicle sets in development for this line: an invader tripod, a space patrol rocket ship and an Imperiax flight bike. We shall see how this all unfolds. Put it this way ... if it came down to me wanting to do it, it is overdue. This is coming together very nicely. Excellent work, as always. You should do the speeder bike this will be bigger and more like those star wars racer things, but with guns. It won't be out until the fall I think. Unless I sell a ton of the retro space sets. Let's just say that we've lost touch on the project. I'm not up to doing it on my own ... yet. Dave the second set preview looks excellently done as well. I've lead a 20 year Genocidal Campaign against anything resembling a Space Elf, so your new project has given something new to loathe and destroy. How about some big, brutish, possibly green skinned Aliens, with an overbite, extremely warlike culture, and crude, but space worthy technology ? Or... Robots, you can't go wrong with robots. I've seen Dave's Robots, in his books, and I would definitely buy his robots. 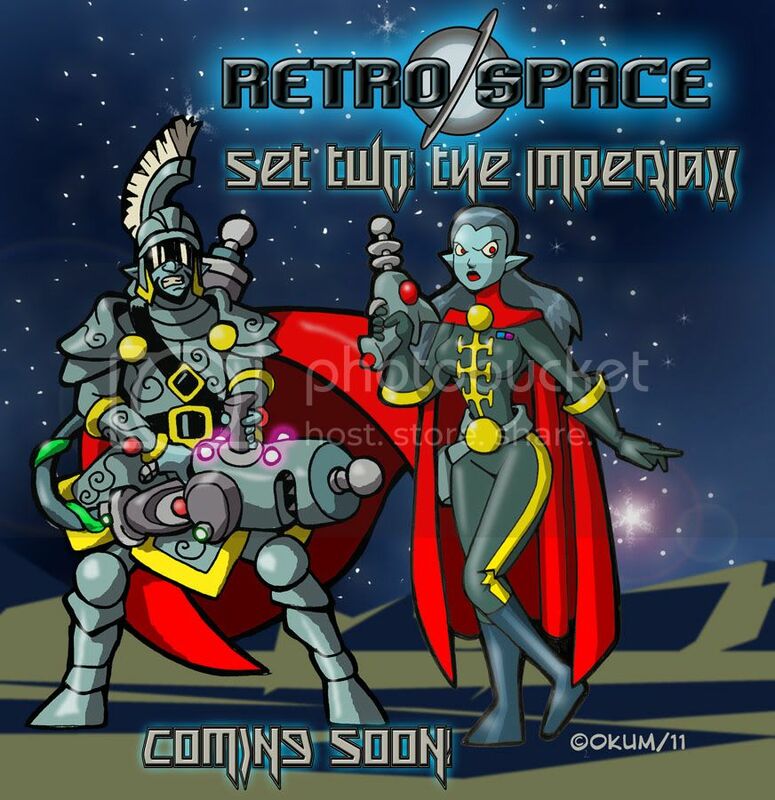 Announcing the release of Retro Space Set Two: The Imperiax. Multi-layered pdfs means there are 48 possible minis. Finally, someone for the Space Patrol to chase around the universe. I am not in that Retro-thing at all, but your design is full of skill to the extreme, Okum. And I see you launching one rocket after the other, right now ... . Great stuff, indeed. Bonus Freebie set available here for you Imperiax fans! 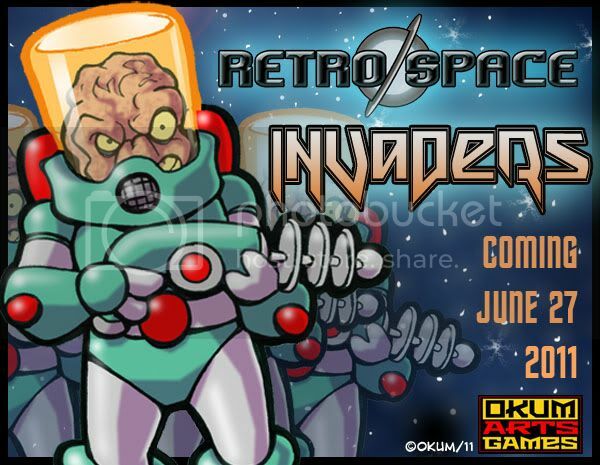 Teaser for Retro Space Set Three: Invaders. 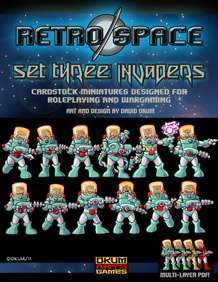 Retro Space Set Three: Invaders is ready to download! Take them to your leader. I'm going to start getting into the "fluff" of the Retro Space Universe soon. I think it will be fun. What kind of releases would people like to see? The non-combatant Imperiax figures are very good for inspiring possible scenarios. 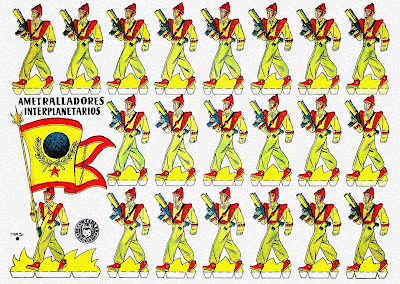 It would be good to see some non-combatants... ambassadors, space crewmen, functionaries, celebrities, etc... for the Space Patrol figures to have to ride herd on! Among the influences on my thinking about retro-sci-fi skirmishing are the Retief stories by Kieth Laumer. Retief was an underling in the Terrestrial Diplomatic Corps, and the stories were usually set on some "third world" planet. There was a cold war going on between the earthlings and a race of insectoids (reminiscent of preying manitses) called the Groaci. The Groaci were usually pulling off some underhanded stunt, and Retief would have to do an end run around his pompous, ineffectual superior, and beat the Groaci without causing an incident that would start a galaxy-wide hot war (or get his boss in trouble with the home office). From the plenteous number of Imperiax babes, it would seem that the Space Patrol and the Imperiax are under some sort of uneasy truce, with female Imperiax agents plying their wiles on the virile males of the Space Patrol to gain advantages that can't be won in open combat. Lots of potential for low-level conflict there, especially when some Imperiax guy feels his honor has been besmirched by some Space Patrol guy messing around with an Imperiax babe. Especially since sometimes the Space Patrol men AND women actually DO fall in love with their Imperiax counterparts, and vice-versa. The Space Patrol and the Imperiax are natural enemies, but sometimes they have to join forces to fight the Invaders. Awesome doesn't seem to express how wonderful these sets are. And I thought you hit your highnote with "Where no man has gone before." Just too awesome for words. (Unrelated: the hoverbike idea I had has gotten temporarily lost, and I am side-tracked with CRITTER VALLEY currently... sorry). I'm working on the designs for the Invader's Tripods and Flying Saucer for September release. Now, THAT'S what I'm talking about! Anxiously awaiting these!